At about 1645 hours on 19 December 2013 , Singapore Airlines flight SQ421 , a Boeing B777-200 aircraft ingested an empty cargo container into its left engine while docking at Bay F37 at Changi Airport after arrival from Mumbai. 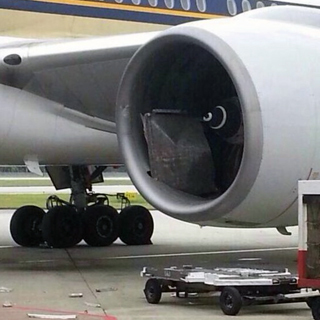 The left engine of Singapore Airlines flight SQ421 sustained serious damage and had to be replaced. There was no injury to any person. The cargo container and two baggage trailers had been left in the equipment restraint area of bay F37 by an equipment operator who was preparing to service an arriving aircraft at the adjacent bay F42. 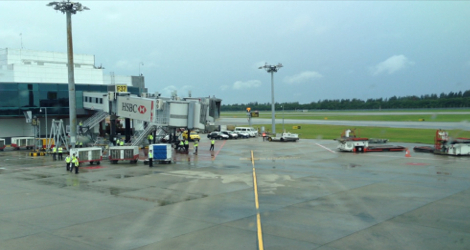 The Air Accident investigation Bureau of Singapore classified this occurrence as a serious incident. The investigators wished to determine whether the Singapore Airlines flight SQ421 crew of the aircraft could have been aware that the cargo container and the BTs were in the ERA. A simulated docking at F37 was carried out on 23 December 2013, using a B777 on tow on the centerline of F37 and with a cargo container and two BTs positioned at the same location as on the incident day. The investigators were on board the B777 to assess the view of the bay from the cockpit. The investigators could have a reasonably good view of the equipment in the bay after turning into the bay. 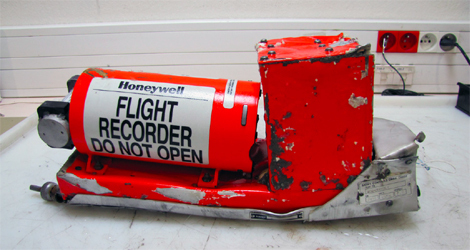 It was not easy to judge whether the cargo container and the two BTs were in, or not in, the ERA (see Figure 4). 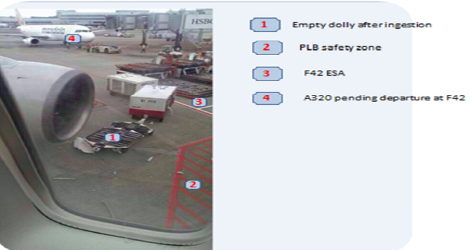 However, one could infer, from the fact that the PLB safety zone could not be seen, that the cargo container and the BTs were in the ERA obscuring the PLB safety zone. 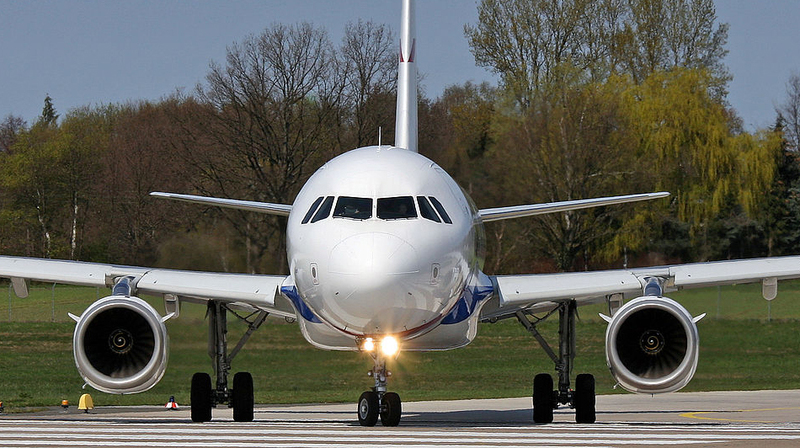 Likewise, one could infer, from the fact that the wheels of the aerobridge could not be seen, that the cargo container and the BTs were in the ERA.